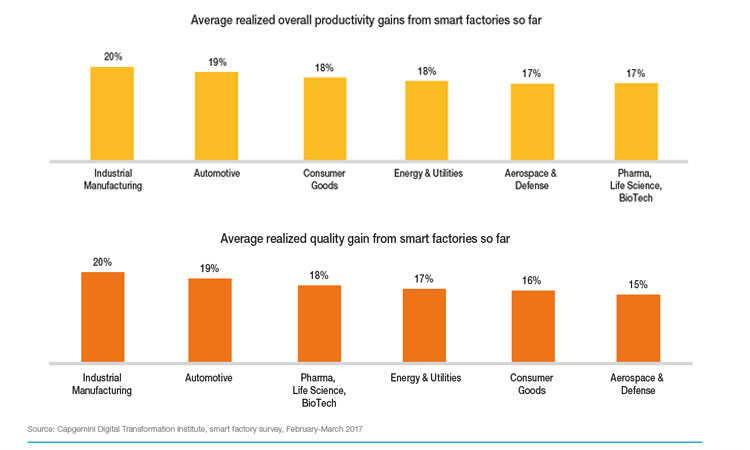 Though 76% of manufacturers either have a smart factory initiative that is ongoing or are working on formulating it, only 14% of companies are satisfied with their level of success. Only 6% of manufacturers are ‘Digital Masters’: an advanced stage in digitizing production processes with a strong foundation of vision, governance and employee skills. 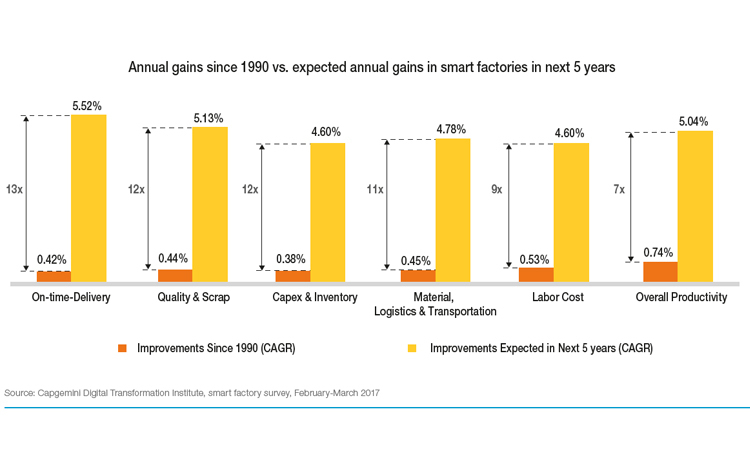 Manufacturers across segments are harnessing the potential of smart factories, with industrial manufacturing seeing the biggest gains in productivity and quality of output. Key Geographies: Our research shows that the US and Western Europe in particular have made an early head start. Nearly half of manufacturers in the US, France, Germany, and the UK have an ongoing smart factory initiative. With the appropriate investment of resources as well as effective transformation management, average manufacturers can become industry leaders through the implementation of digital technology into their processes. Analysis of a hypothetical average car and truck manufacturer with revenues of $1 billion and a 5% operating margin revealed that manufacturers that currently operate at an average level of effectiveness could experience benefits that would launch them into an industry leadership position. This gain in operating margin–ranging from 36% to 108%–is the combination of enhancements in productivity and efficiency along with a reduction in various costs. 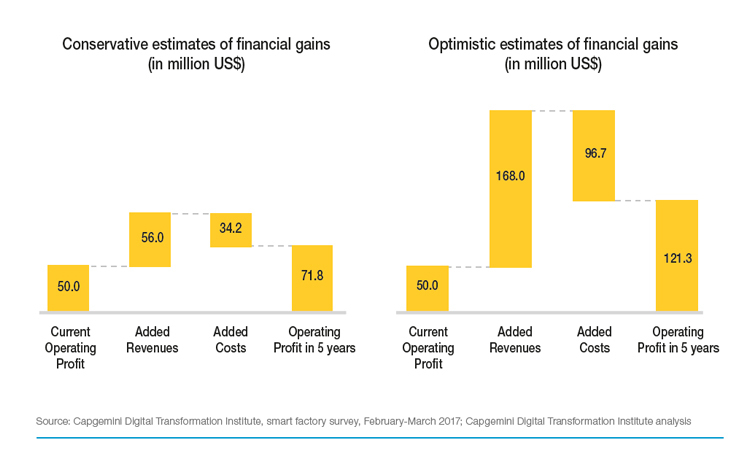 As a result, investments in digitalization to realize long-term gains cannot be ignored by any manufacturer. 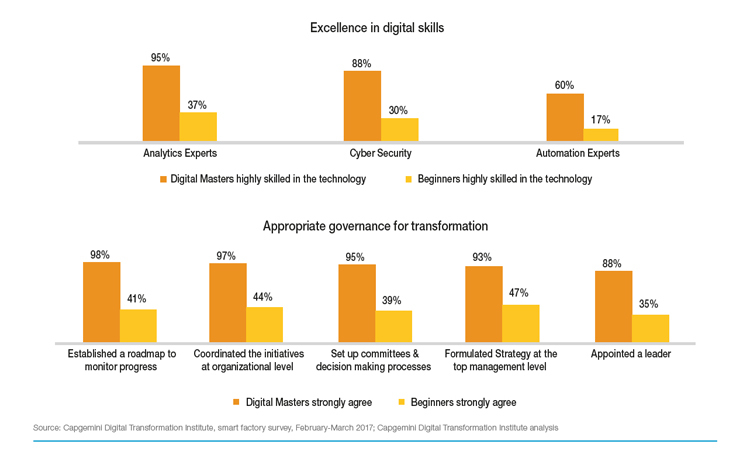 Transformation Management Intensity: Digital skills and governance are the two biggest differentiators in the transformation management intensity. We found that very few beginners are satisfied with their skill levels in key areas such as data analytics, automation and cyber security; whereas most masters felt they have the skills required. In the governance area, a majority of the beginners are not following the basics of transformation governance, such as appointing a leader and establishing a roadmap. 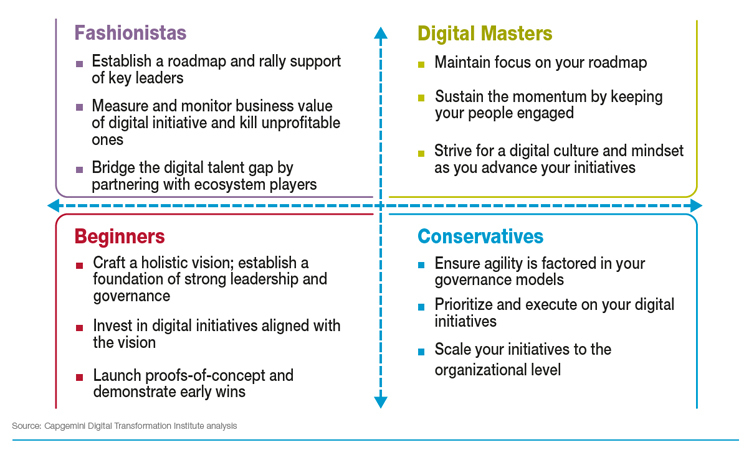 Our analysis points to the key characteristics of digital masters. 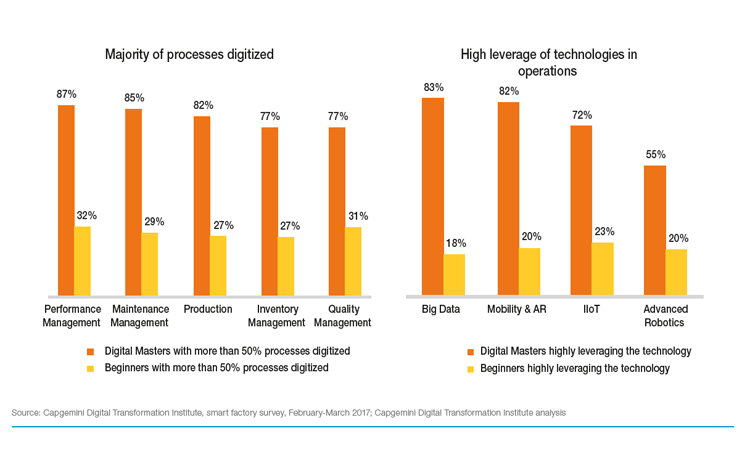 Digital masters are making better progress on smart factories compared to their peers: 72% of digital masters have made good or better than expected progress on their smart factory initiatives, compared to only of 37% of beginners. 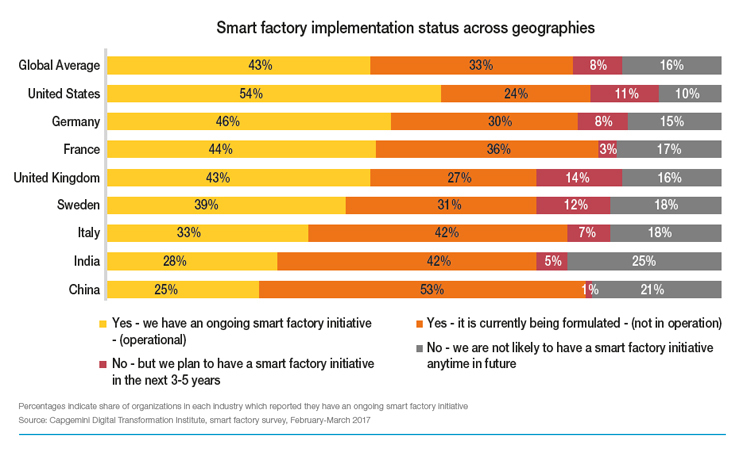 Worryingly, for beginners, 39% of them say that they are struggling with their smart factory initiatives. Digital masters are making aggressive investments, including training: 45% of digital masters have invested more than 10% of their annual revenues over the last five years in smart factory initiatives, compared to 17% of beginners. And 73% of masters have spent a significant share of their training budget to build digital skills, compared to 17% of beginners. 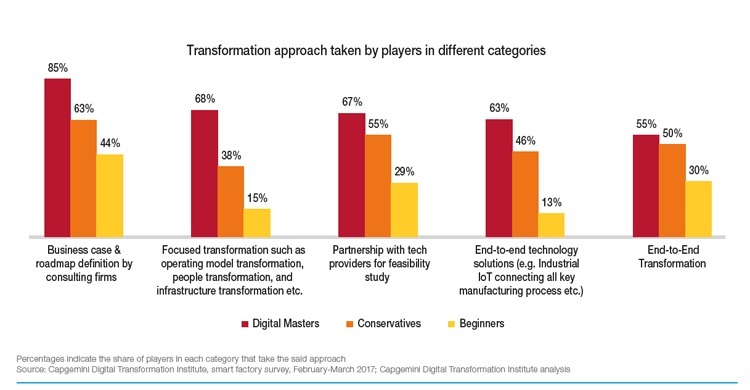 Digital masters have more aggressive targets: 58% of digital masters are aiming to achieve break even on smart factory initiatives within 5 years, compared to 18% of beginners. Masters also have more ambitious operational KPI targets. For example, 40% have a quality target, compared to 26% of beginners. Key operational KPI targets for beginners also fall considerably short of the targets set by the digital masters.